It’s barely February, but my daffodils have buds, and clouds of daphne perfume lurk in pockets on the street. It’s not yet the spring of Easter egg colors and Guerlain Chamade, and it might snow again anytime. No, it’s a sort of pre-spring. It’s the perfect time for the knife-edged green beauty of Paco Rabanne Calandre. Perfumer Michel Hy developed Calandre, and it launched in 1969. Its notes include aldehydes, bergamot, green notes, geranium, orris root, jasmine, lily of the valley, rose, amber, oakmoss, musk, sandalwood and vetiver. (Michel Hy was a genius of the green chypre — he also worked on Yves Saint Laurent Rive Gauche, Yves Saint Laurent Y and Balmain Ivoire.) In French, the word “calandre” means “grille,” as in the grille on a car or a radiator. It also means “mangle,” a machine that irons linens when you feed them through its long rollers. With Calandre’s feel of freshness and molar-tingling metal, the name fits. Calandre opens tart and sharp, with bergamot and aldehydes that practically buzz. When the top notes part enough for you to see more deeply into the fragrance, a tight new rose — a rose really too green to cut from the bush — emerges, and it’s wrapped in geranium, lily of the valley and moss. The sensation is jarring, like licking an aluminum spoon full of citrus, grass clippings, torn geranium leaves and rose petals. Just when you think Calandre might be too bitter and assertive to enjoy for more than a few curious minutes, it sweetens slightly and spreads its roots of sandalwood and vetiver. All of this takes maybe fifteen minutes on my arm. This is when Calandre’s beauty really unfolds. It is spare and nicely balanced, but not banal. Like most great perfumes, it has a definite signature, and once you’ve smelled it, you’ll always be able to identify it. Calandre reminds me more of the simplicity and modern confidence of Geoffrey Beene's vintage fashion than of Paco Rabanne’s late 1960s production of fringe, lamé, and costumes that might have made the trip in Barbarella's space ship. Liberally applied, Calandre lasts hours on my skin, but it’s quiet after the first hour. I also have an old bottle of Eau de Calandre that’s brighter up top and thinner in the middle than the regular Calandre, but still wonderful. The bottle I’m sampling from for this review is probably from the 1980s, and isn’t labeled for its concentration. I’ve heard Yves Saint Laurent Rive Gauche is a sister fragrance to Calandre, but it’s been too long since I’ve smelled it for me to comment. I can say, though, that if you want something in the same vein but sweeter and rosier, try Chloé L'Eau de Chloé. For a grassier take with a hint of lemon, Chanel Cristalle Eau de Toilette works. For something more ladylike, try Estée Lauder White Linen. 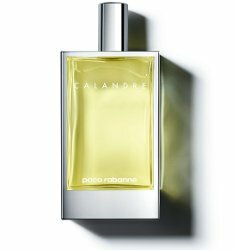 Paco Rabanne Calandre Eau de Toilette is still in production, although it’s hard to find in stores. Online, you can order a 100 ml bottle from the usual suspects for less than $60. I wonder how the recent Calandre is different from the vintage versions. I have always been interested in trying this perfume, but it’s not something you can buy here in Denmark. I don’t think it has ever been on the market here. I have been tempted to blind buy, but I have learned my lessons. You’re wise not to blind buy! I have also learned that lesson–the hard way. As for Calandre today, my guess is that it still smells like Calandre, since the signature is so distinct. But the richness of the oak moss and overdose of bergamot and lush floral heart probably isn’t there like it used to be. I hope someone else can chime in and tell us, though. Me same. I’ve been curious about this one for years but have held off a blind buy, fearing reformulation. But I think I’ll take the plunge, as I love this genre. No 19 is practically my signature and I’m fond of Rive Gauche, Cristalle, YSL Y, Private Collection, White Linen … that sounds like a good reason NOT to bother with Calandre doesn’t it? But curiosity will get to me in the end, I just know it. It does sound like Calandre is right up your alley…. I’ve seen quite a bit if Calandre dead stock in brick-and-morter discount stores. I live in a city, though, so there are a ton. I’m sure at leeway one of them has a tester. I’m curious too about the reformulation. If you stumble over one, I’d love to know what you think of it! I’m like littlecooling, I never see it where I live. But it’s widely available online for a good price. I should really grab some in case Calandre goes the way of the Dodo. I hope it sticks around, like Guy Laroche J’ai Osé did, even if someone else produces it. Maybe you could put it up in the splitmeet. I’d go in for 10ml! I blind bought this one, based on this review. Tricky, but it worked out very well!! What a great scent!! A bit granny, as in “what would granny have worn when she was hip, chic&urban all those years ago”. Really love it. Also great that nobody in my vicinity smells like this. Now I’m tempted to get J’ai osé blind too…. I’m glad it worked out! It’s definitely not a fashionable scent, but it’s fabulous all the same. Ahh, I remember loving Calandre in the late 70’s! Thank you for trip down memory lane. If I remember correctly, it had a sharp green opening reminiscent of Private Collection? I still have a bottle of 70s era PC. Going to go sniff it now???? Its opening is super sharp and loaded with bergamot! Private Collection is a terrific green chore, too, although not as angular and metallic. I bet you smell great right now! I have a vintage splash bottle that I inherited from a friend’s grandmother who was being put into assisted living. It must be spray versus splash with this one. My Y smells much greener than Calandre. Probably the same vintage for both. Actually, hold on. I’m going to try on a dab. Glad I did! My top notes are moderately damaged, but the heart is glorious. I would still say it’s more plush than Y. That sandalwood is gorgeous! Smells a but like No. 19 parfum, velvety soft. 19 but less vetiver, more sandalwood. There is a note, almost like lime peel. Almost soapy but definitely a FINE fragrance. I love the dry down with all that sandalwood and vetiver. That, and a touch of amber, takes the edge off its tartness. How terrific that you have a bottle! It’s still going but it sure is soft spoken. Wish I had an atomizer bottle though. That reminds me, Angie. I’ve recently gotten a bottle of Courreges Empriente, the newer reformulation. I complimented a woman’s perfume once and she told me that she had worn it, as did her mother before it was discontinued. It’s very thrifty (only about $15!) but it is a modern green chypre reformulation done right. Not much of the floral richness of Calandre but a rush of hay, jasmine, and vetiver. I got so excited when I tried it. At that price, I’ve got to try it! That’s even worth a blind buy. It’s got pretty divided reviews on Fragrantica from old wearers but the lady I met swears it’s the same. She bought ten (10!) bottles since it was so thrifty. I have a gorgeous bottle of the vintage parfum in a gold-dipped bottle with big round cap but it’s so evaporated it is hard to know which end goes up. I love the new version though. It’s so refreshing to hear “I love the new version”! Ha, I probably should have just retyped the comment but oh well. Great review Angela! Calandre sounds very much like my kind of scent. I’m a fan girl of two of the alternative scents that you mentioned? Although, I haven’t tried the Chloe flanker. Another possibility to add to my ever growing sample list. Oh, the “ever growing sample list”! I know it well. How fabulous that you’ve worn the extrait! And it’s fabulous, too, that you still love it after all these years. Vintage Calandre and Rive Gauche are some of my favorites, but I haven’t tried more recent versions. They are similar, although I’m not sure I would have focused on that had I not read it somewhere (Luca Turin, I think). Rive Gauche gives you such an immediate rush of Paris!!!!! !, which is what I always remember and love about it, and Calandre starts out quietly and diffuses beautifully but softly. The impressions they create (at least in the versions I have) are very different even though they do smell similar, ultimately. It’s interesting to think about Michel Hy working on both fragrances. He must have been completely immersed in green chypres at one point and felt all the distinctions between Rive Gauche and Calandre. Thank you for reporting in! One of Calandre’s pleasures is its intensity, so it’s disappointing to hear that it smells vaguer now. While I liked and wore Calandre in the late 70s as a pre-teen I always had a soft spot for her sister, Paco Robanne, Metal which is impossible to come by nowadays. Angela, have you ever tried that one? It is similar to Metal but has that metallic vibe like Rive Gauche always did to my nose (another favorite I wore many many years ago in my youth). What I MEANT to say was that Metal was similar to Calandre…..
My brain read it the right way the first time! No, I haven’t tried Metal, although I feel like I’ve seen it over the years–or maybe I’ve just seen ads. I’m really curious to try it, though. When you think about PB La Nuit, they really had some interesting fragrances! I bought a bottle of Calandre from Marshall’s in the 1980s. In those days I bought perfume only from Marshall’s because it was all I could afford. I didn’t care if they were for men or women–if I liked the scent, I would buy it. I don’t know what happened to those early purchases, and I thank you, Angela, for your review, which has led me like a lemming to repurchase. I used to shop Marshall’s religiously! And Ross. Someday we should do a post on Best Perfume Bought at Marshall’s.